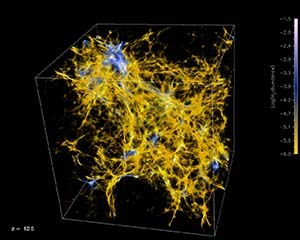 Numeric simulation of the intergalactic medium cosmic web. Credit: Massimo RicottiJSI is a partnership between the University of Maryland (UMD) and the NASA Goddard Space Flight Center (GSFC) aimed at creating a center of excellence in space science research. JSI brings together scientists from the UMD Department of Physics, UMD Department of Astronomy, and the GSFC Astrophysics Science Division, and is dedicated to fostering new areas of research at the interface of physics and space astronomy. This mission is achieved via direct collaboration between JSI Fellows and Affiliates as well as active undergraduate, graduate, and postdoctoral research programs. Current areas of focus include the use of black holes as laboratories for testing General Relativity (using both gravitational wave and electromagnetic observations), plasma processes in black hole accretion flows, the particle physics of dark matter, and the implications of these fields on the formation and evolution of galaxies. MOU signing for JSI creation. 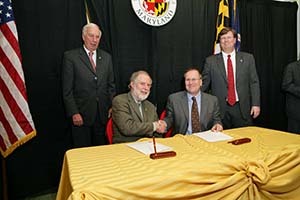 From left: UM President Mote, CMPS Dean Steve Halperin, Director of Sciences and Exploration at Goddard Nick White, Goddard Director Robert StrainOn March 4th, 2010, officials from the University of Maryland, College Park and NASA's Goddard Space Flight Center in Greenbelt, Maryland signed an agreement creating a new Joint Space-Science Institute with the mission of sharing resources and expertise in building a world-leading institute for space science. This new institute will build on the many existing research partnerships in high energy and particle astrophysics, space and black hole physics, cosmology, and planetary and solar system astronomy. See also the press releases at the Maryland Newsdesk and on the Goddard website, as well as the message from University President Mote.